This week Umission honors Andrea Adams, and is making a donation to the charity of her choice Six String Heroes. 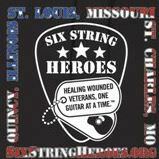 The mission of Six String Heroes is to provide guitar lessons and guitars for United States veterans who are suffering from mental or physical injuries as a result of military service. Hats off to the Six String Heroes for using the power of music to restore the soul.